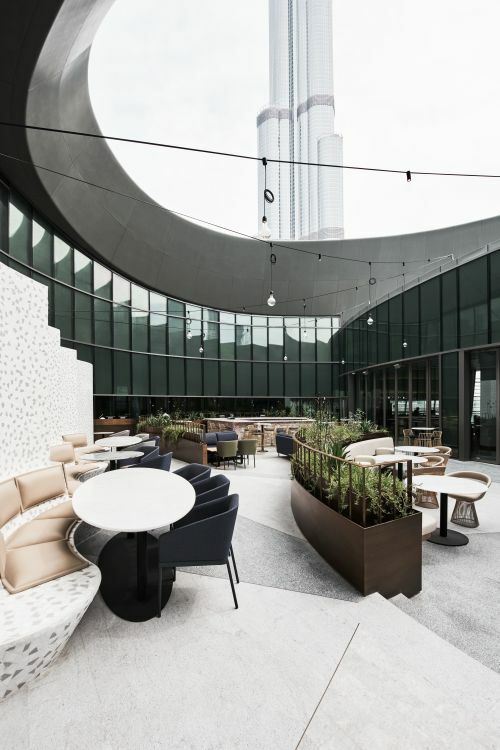 The luxurious 350-person restaurant and bar, designed for internationally acclaimed chef, Sean Connolly, looks out over the Burj Khalifa in the heart of bustling Dubai. 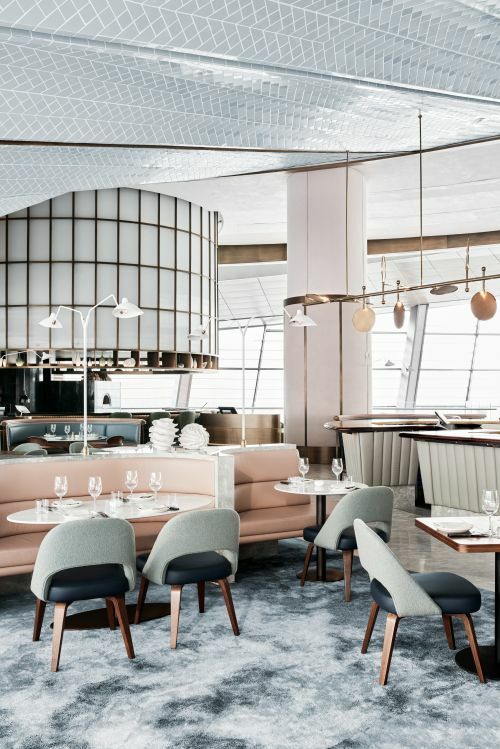 The venue spans 2 000m² of the upper level of the Dubai Opera and includes a brasserie, dining areas, several bars, a chef’s table and an external sky garden. 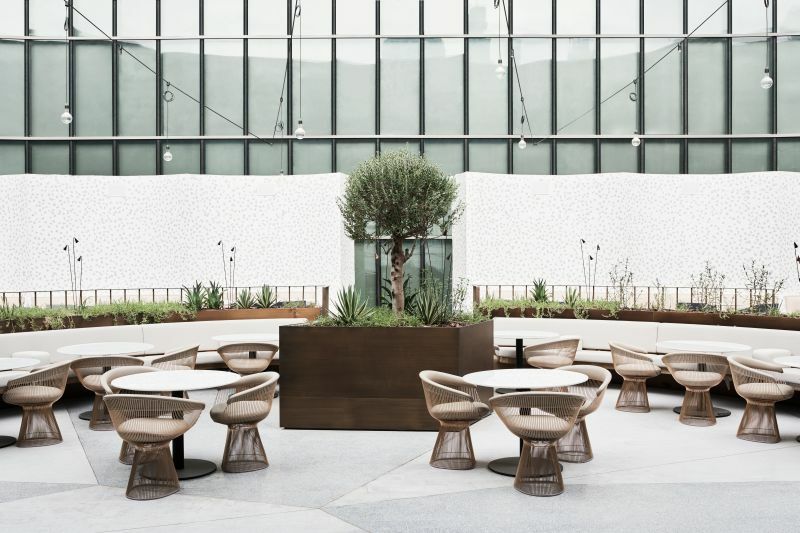 The restaurant was inspired by the highly irregular shape and scale of the building, and drew upon Alexander & Co’s personal interest in 20th-century classic design and architecture combined with the oceanic Australian/New Zealand influences of Sean Connolly’s cooking. Using “common materials for uncommon outcomes”, each design element within the venue explores ideas of the sea, from the oyster shell with its combination of smooth sensual surfaces and textured outer surfaces, to the oceanic tones and colours of corals and pearlescent hues. 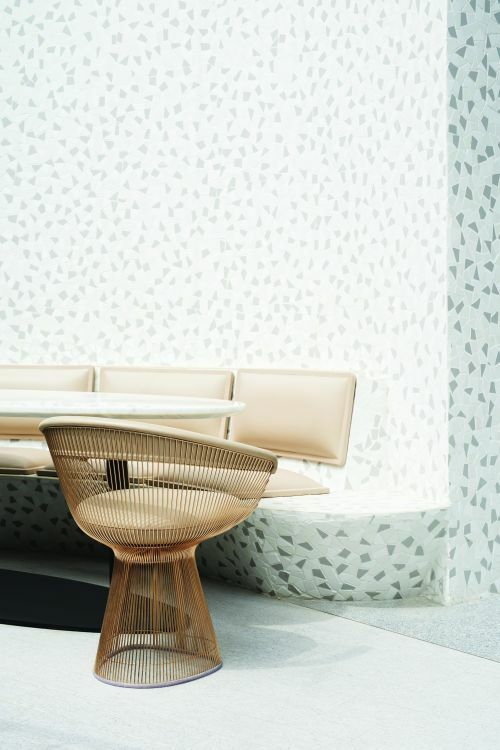 A white tessellated mosaic wall reminds of broken shells and provides a backdrop for relaxed dining in the courtyard. The main spaces are focused upon the central cocktail Pearl Bar, constructed from grey leather, walnut timber and yellow marble. The grey marble banquettes with their pink leather are reminders of the delicate contrasts of the ocean corals and sea creatures, while the raw and fire bars remind of the outer edges of blackened seashells. 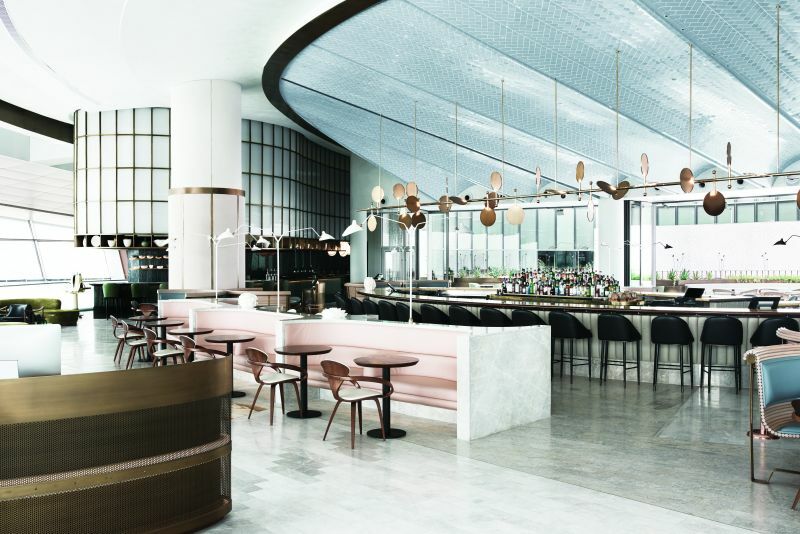 A highlight is the vaulted tiled ceiling, which references both the inside of an oyster and the iconic geometries of the Sydney Opera House, which are jewel-like and reflective. In addition, the custom handmade woollen carpet with its blue dappled tones is a depiction of the ocean waters and was custom designed by Alexander & Co for this venue. 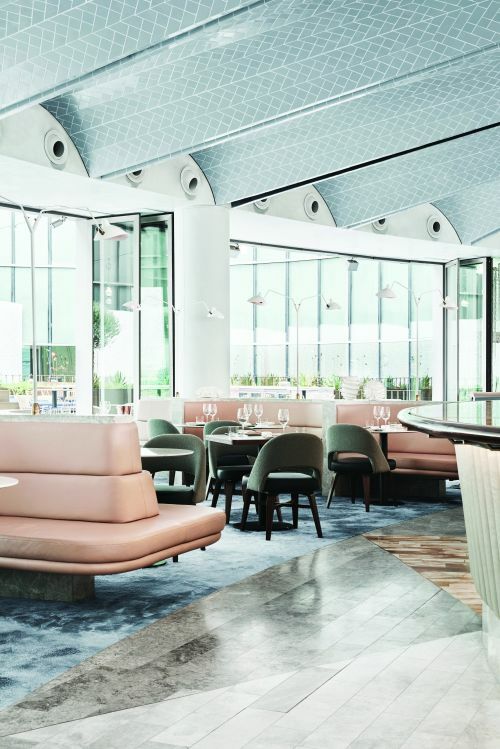 Vaulted ceiling tiles, which reference both the inside of an oyster and the iconic geometries of the Sydney Opera House, are jewel-like and reflective. In keeping with the Antipodean theme, Jacqui Fink, an international pioneer of “extreme knitting”, created a custom 6m high Merino Wool hanging artwork (one of her largest commissions to date) as a nod to the tentacles of sea creatures – delicate and mystical. Local Sydney artist, Tracey Deep, who is known for her floral installations, used found and native flora to create three hanging sculptures curated to the oceanic vision. The interiors were fitted out in oceanic tones and colours of corals and pearlescent hues. Also following 20th-century design inspirations, the classic Serge Mouille lighting has been custom-made in curving white enamel steel and brass finishes. Similarly, cult 20th-century furniture originals are combined in greens, greys, blues and whites with natural walnut timbers. They are sculptural and feminine and add significant value to the interest of the overall aesthetic. Full thanks and acknowledgement are given to Alexander & Co and V2com for the information given to write this article. The view of the Burj Khalifa from the skybar.